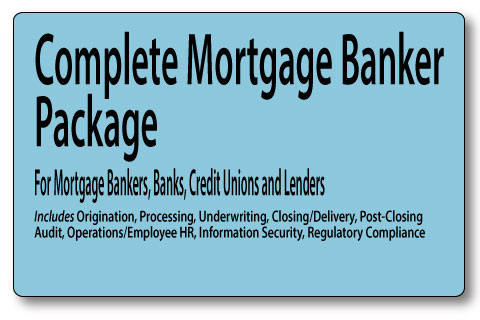 The Mortgage Banker Package is our most complete set of operating procedures, policies, training, and organizational documentation. For those companies planning a start-up, or those initiating process improvement, this package gives you the complete foundation containing virtually all of our products for this specific business model. Mortgage bankers, banks and credit unions originate and process like most entities, but they also underwrite and fund. Adding these elements to the production process completes the management pack. Dependent on your business model needs, we offer money-saving packages of modules designed for you. In this way, you can get the most complete documentation you need for your business model as a savings of 40%-70% over the a-la-carte individual modules. Together the elements in the Mortgage Banker Package would cost nearly $3,000 if ordered a-la-carte. By packaging them together you gain substantial savings. Referred by an affiliate or trade association? Click here to request a discount code.